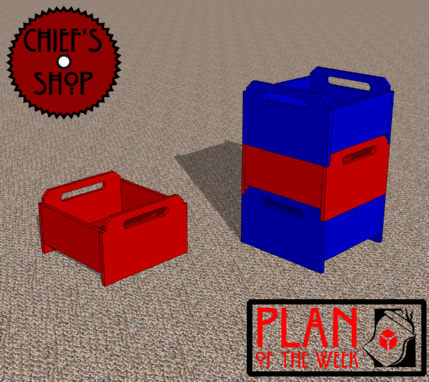 The Chief’s Shop Stacking Storage Bin adds storage to a kid’s playroom, craft room, or even a shop. Multiple bins can be stacked snugly one on top of the other. Overall dimensions: 18 inches wide x 18 inches deep x 11 1/4 inches high. You’ll need a table saw or circular saw with a guide, miter saw, jigsaw, drill driver, and Kreg Jig to build it.